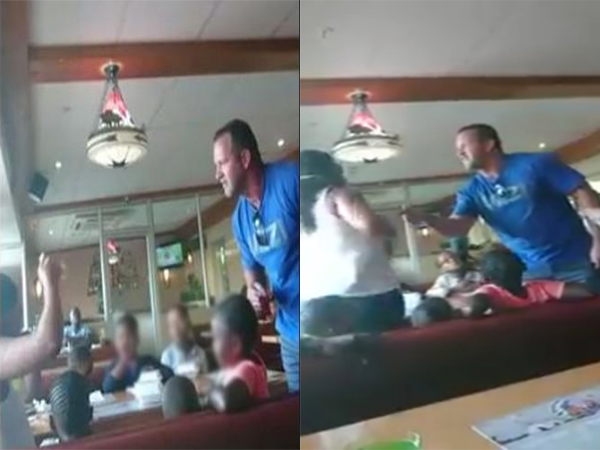 The mother involved in a heated argument with a fellow patron at a Spur restaurant, says her son has suffered emotional trauma after video footage of the incident trended online. The media attention had further amplified his trauma, Lebohang Mabuya, 33, told News24 on Wednesday. A video recording of the incident has been trending on social media. It shows Mabuya and a middle-aged man screaming profanities at each other in the Texamo Spur in the Glen Mall, Johannesburg, on Sunday. Mabuya, a nurse, said she was drained from the media interest. “You know, it’s overwhelming, and with my job, I don’t always have my phone with me and so I am tired receiving so many missed calls,” she said. In the CCTV footage News24 has seen, a black girl walks toward Mabuya’s table and says something while Mabuya shakes her head. While the girl is talking to Mabuya, a man walks towards the table and points aggressively at her. The man grabs the girl’s arm and pulls her towards him. Mabuya pulls the child back towards her, stands up and starts pointing at him. The man walks away, but returns after Mabuya shouts at him and then lifts the table. His partner tries to calm him down and they leave the restaurant. Spur said it would release the CCTV footage after consulting its lawyers. Mabuya said she did not plan to press charges against the man. “I saw the trauma my son experienced and decided not to press any charges. What good is it going to be?” she asked. Mabuya said she was not proud of what happened. “I had to sit him [my son] down and explain that the language that was used was not allowed. Mabuya said she was not willing to see the man again. “Honestly speaking, there’s not any hard feelings because I don’t hate him or anything, but for the sake of peace I think it’s best if we do not meet. If he or I apologise, it would be trivial,” she said.